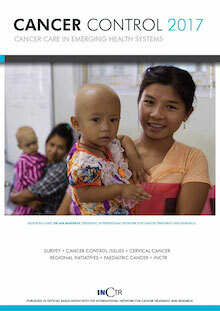 cancer research and treatment in developing countries. INCTR's headquarters are located in Brussels and it has Branches and Offices located throughout the world. It has staff and consultants dedicated to the accomplishment of its goals. INCTR functions through a series of INCTR-wide programs that involve collaboration with its Branches and Offices, partners and institutions in low and middle income countries. This section has a collection of materials developed by INCTR to raise awareness about cancer control in developing countries and to assist health professionals in resource-constrained countries with their daily work. INCTR recently launched a new project in order to improve access to comprehensive quality cancer care to children in Northern Uganda who are treated by St Mary’s Hospital Lacor in Gulu. Donations to this project, entitled “Improve Quality Childhood Cancer Care in Uganda”, may be made via Global Giving. The link to the Global Giving project page is goto.gg/35580. Cancer Control 2018 will be published on-line in November 2018 and will provide reports from INCTR’s major programs. INCTR and ecancer have agreed to collaborate to provide palliative care training for India. ecancer is a UK-based charity which provides free educational resources to the global oncology community. The ecancer course, “A dignified death: An essential e-learning course on palliative care for India” is available on-line. It offers health care professionals practicing in India full access, at no cost, to a series of modules focused on palliative care. To take the course, prospective participants must register with ecancer.org at https://ecancer.org. Enter your e-mail address and receive the INCTR Newsflash by mail. Help INCTR bring comfort and hope to those who need it most by making a donation, voluntering, or supporting our activities. INCTR's success depends greatly upon the support of individuals, institutions and corporations worldwide. Members participate in ongoing projects, serve on committees, or simply provide financial and moral support.